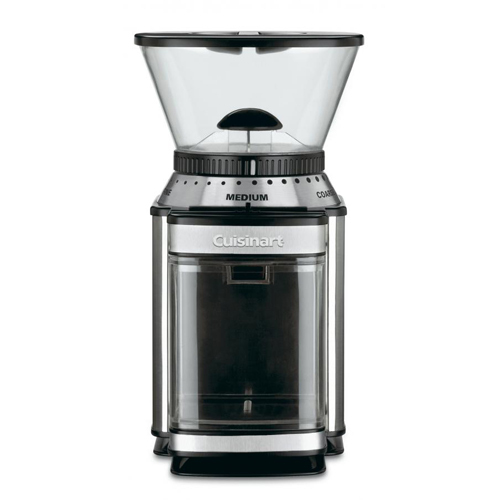 The Cuisinart DBM-8 Supreme& #153; Grind automatic burr mill grinds coffee beans consistently to preserve delicate natural oils, maximizing both flavor and aroma. Outfitted with a heavy-duty motor, the machine has 18 grind settings ranging from fine to extra-coarse, which are controlled by a clearly marked, pleasantly clicking dial. The DBM-8 features automatic operation that covers quantity as well as quality and shuts off when the desired level is reached. 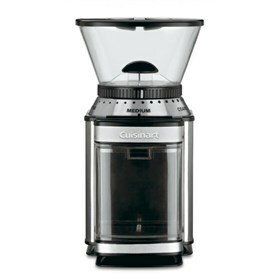 The grinder has brushed stainless steel housing and black accents in durable plastic. The removable parts remove easily for cleanup, and a safety feature keeps the grinder from operating without the hopper and chamber in place. The Automatic Burr Mill has many exciting features for users of all types. You can extend the lifetime of your Automatic Burr Mill with the purchase of a FactoryOutletStore Factory Protection Plan. See the Automatic Burr Mill gallery images above for more product views. The Automatic Burr Mill is sold as a Brand New Unopened Item.